Anyway, I called the store and they said this pricing is available for any current line with an upgrade available not just news lines of service. They didn’t have any in the store but they said they could have it shipped to our house within 3-5 business days. The annoying part was they said they would activate the new phone right away and her old phone would stop working right away. I didn’t really like that idea but for $50 less, it seemed worth it. When I went into the store to order the phone, they said the warehouse was sold out and they couldn’t even order one. They even tried calling some stores that showed one in stock but they were already sold. They took my name and number and said they would call me if one came in or the online store/warehouse restocked. Later that night, I got a call from the store saying the district manager was somewhere else in the state at a store that had one and would bring it back to my store if I could come in tonight to pick it up. Unfortunately, I had an event to run and could not make it in until morning. They were ok with that and so I headed it at 9:00am to pick it up. When I got to the store they had my iPhone and all went pretty well. They were their annoying selves, asking over and over if I wanted to buy Apple Care, a screen protector, charger, or case. My total came out to be about $155. 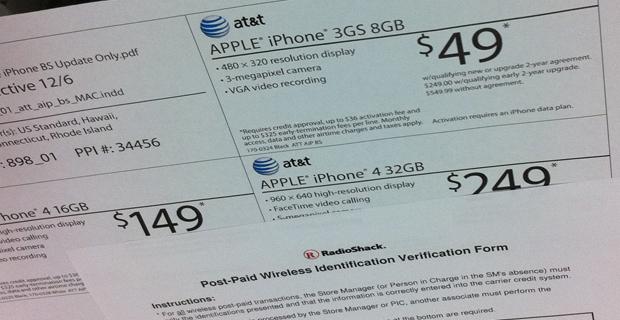 The activation fee will come out of my bill with AT&T later. They didn’t open the box and activate the phone there in the store but my wife’s iPhone was deactivated. That was a fail because I thought I might be able to tell my wife they were sold out and surprise her on Christmas. Anyway, I gave her her phone and she loves it! This might sound far fetched but it is my understanding that ATT is a bit upset with Apple since the iPhone is about to be launched on Verizon. 1. lock the customer base into a contract. 2. get rid of their stock. Talking to a ATT rep here I was told that ATT was looking to launch a rather high number of Android devices as well as push Blackberry’s more, but nothing about any apple products. Before I left the store the rep (a personal friend) told me that they were concerned of the migration that was about to take place from ATT to Verizon. Now I hear that Verizon has a major announcement scheduled for Tuesday @ 1100. All vacations have been canceled at the Apple stores for January and into February. Since Verizon spoke about their 2011 Android lineup, LTE, Tablets, at the CES what would be left to announce??? Again its just what I have heard.